EzyOnlineBookings.com lets businesses accept online bookings and payments right on their existing website. It’s a complete online reservation solution that integrates with PayPal and Google Calendar. Most importantly it’s easy to setup and easy to use. EzyOnlineBookings.com has been designed to be easy to setup and install, and easy for customers to use. 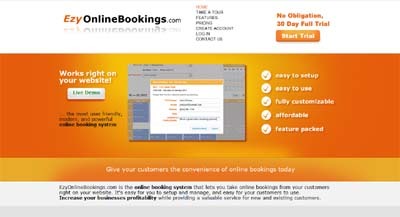 Unlike other online booking systems, EzyOnlineBookings.com doesn’t force customers to create accounts to make bookings. The software works within the businesses website, rather than redirecting customers to a separate site to complete their bookings. The business owner can choose what information they want to collect from customers. Like most good online reservation systems, EzyOnlineBookings integrates with PayPal and Google Calendar. Unlike other reservation systems however, EzyOnlineBookings.com uses the latest Google Calendar API technology, which lets the system update Google Calendar instantly, and changes made to bookings in Google Calendar are updated in EzyOnlineBookings.com.